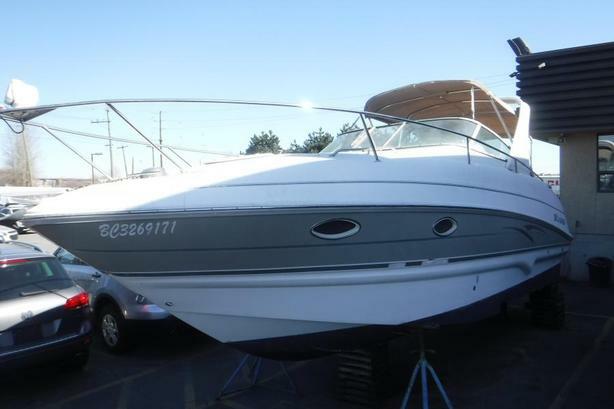 2007 Larson Cabrio 274 Cruiser Boat Power Boat, 5.7L, 8 cylinder, Volvo Penta engine, 27 feet long, white exterior, white interior, vinyl. Cabin amenities include washroom, sleeping area and kitchenette with microwave, sink, single burner stove top and fridge. Boat comes with bimini top and cockpit cover. (Running conditioned confirmed). April 30, 2019 price will be increased to $34720 $27,720.00 plus $300 conveyance fee, $28,020.00 total payment obligation before taxes. Listing Report, Warranty, Contract Commitment Cancellation option on Fully Completed Contracts, Financing Available on Approved Credit (some limitations and exceptions may apply). All above specifications and information is considered to be accurate but is not guaranteed. Call 604-522-REPO(7376) to confirm listing availability.